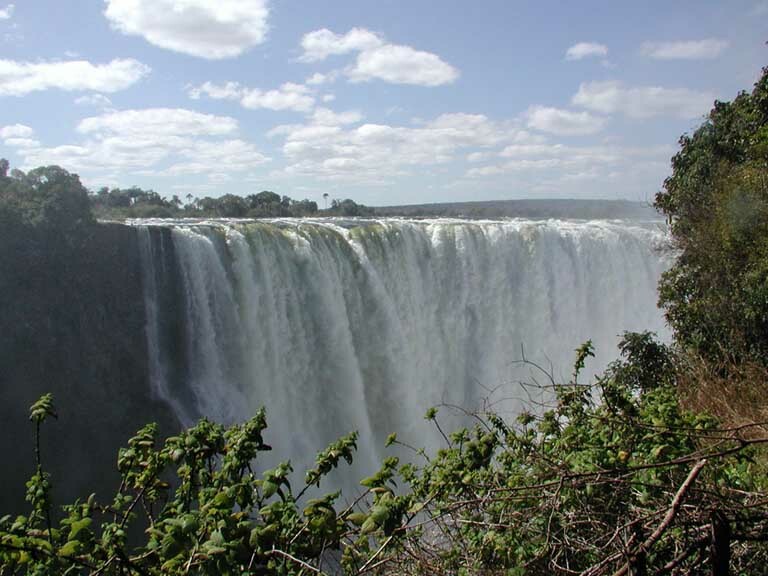 HIGHLIGHTS: Guided tour of Falls, Elephant back safari, sundowner cruise, full day Chobe tour. 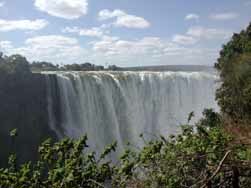 HIGHLIGHTS: Victoria Falls in Livingstone, Zambia plus walking Safaris in South Luangwa National Park. This Safari has been specially designed for those of you who are looking for something completely different from the usual run of the mill type of safaris. We keep the groups small and personally attend to your every comfort. The majority of our time is spent not in vehicles, but actually walking around the bush with a Professional Guide and Armed National Parks scout. You will be able to get closer to the animals than you ever thought possible and the memories will stay with you for the rest of your life. We get well away from any signs of human civilisation and literally spend our time as privileged guests of the animals who inhabit this fantastic location. A trip that is an unbeatable combination of one of the great Wonders of the World and some of the greatest of Africa�s animals will make for an unforgettable experience. HighlightsWaterberg Wilderness Lodge with its majestic sandstone formations, 13 600 square-mile Etosha National Park, the Okavango River, Mahango Safari Lodge and Game Park, Victoria Falls National Park Zambia and more. The Bushcamp Company own and run a group of five individual bushcamps, all within walking distance of each other, allowing you to choose to experience each camp individually, walk through the park by day and camp at a new location at night or to relax for the entire duration of your stay in the camp of your choice. 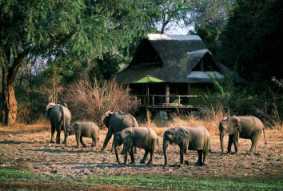 These camps are ideal for small groups seeking a personalised and remote wildlife experience in the African bush. Great hospitality and spectacular opportunities to explore a magnificent wildlife haven on foot. Whether you are an individual, couple, family or a group, we can help you plan your itinerary and ensue that you enjoy the real Africa with absolute confidence and security. HIGHLIGHTS: Kasanka National Park and Bengweulu Wetland - a birdwatcher's paradise. Kasanka National Park is a small but fascinating park that has four rivers and eight lakes flowing into the Bengweulu Wetland. It offers brilliant angling opportunities, and bird watchers come here to see vast numbers of birds, not usually found in Southern Africa. One is the rare and peculiar looking Shoebill Stork, which resembles the extinct Dodo. The swamp forests of Kasanka, also harbour the rare antelope, the Sitatunga, which only lives in wetland areas and is rarely seen. You may also witness the spectacle of millions of fruit bats coming to roost. Although the park itself is breathtaking there are other attractions including the David Livingstone Memorial. It is here that the great explorer ended his final journey. The Nsala Caves contain some of Africa's best rock paintings. The most ancient of these strange artworks is thought to be 20,000 years old. Another of these attractions, and certainly not the least is the Kundalila Falls. HIGHLIGHTS: Chimfunshi Wildlife Orphanage and Chingola in central Zambia. The Chimfunshi Wildlife Orphanage in central Zambia is the largest chimpanzee sanctuary in the world and is a non-profit refuge that cares for a wide variety of sick, wounded or unwanted animals -- but the primary residents are approximately 80 orphaned chimpanzees. Founded in 1983 by David and Sheila Siddle, a British couple who operate a cattle ranch near the copperbelt town of Chingola, the Chimfunshi Wildlife Orphanage has saved dozens of chimpanzees from certain death. The Siddles bestow love and care upon the traumatized apes -- many of whom have been confiscated from poachers, rescued from dilapidated zoos and circuses, or repatriated from as far away as Russia and Haiti -- and gradually introduce them to the extended family at Chimfunshi. Five social groups inhabit the free-range enclosures that span 1,100 acres at the orphanage, and the Siddles' success rate is astounding: in fact, 19 chimpanzees have been born at Chimfunshi since 1991. Chimfunshi was named to the United Nations Environment Programme's Global 500 Roll of Honour for the Year 2000, and recently received a special commendation from the Nedbank / Mail & Guardian Green Trust Awards. The Siddles also earned the Jane Goodall Award in 1995. HIGHLIGHTS: Sundowner cruise, makoro trip, nature trail and cultural village tour, game viewing, bird watching. A variety of options to choose from: game viewing, canoe trips, bush walks, river safaris, tiger and fly fishing, birding, sundownder cruise, makoro trip, nature trail, cultural village tour. Enjoy three nights at Siankaba Lodge then choose from 4 nights at Sausage Tree Camp in Bedouin style tents, the Royal Zambezi Lodge, or Chiawa Safari Camp. HIGHLIGHTS: Lunga River Lodge and Busanga Bush Camp. Game and bird watching, game drives, wilderness walk or canoe trip. 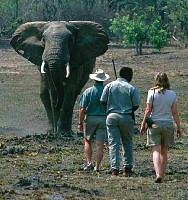 Experience the thrill of a 7-day/6 night mobile walking safari in untamed Africa, 7th night at Mfuwe Lodge. Mobile safaris have long been an exciting way to re live the past, a way to follow in the footsteps of the great explorers, a chance to walk as primitive man did, among the untouched earth, in amongst the last of the great bastions of wildlife. This offers adventurers one of the largest surviving venues to relive the past solitude and grace of unchanged Africa and a chance to view and experience the bush in its most untouched and virginal forms. We take the concept one step further, offering adventurers the thrill of walking safari, combined with the remote luxury of three small exclusive bush camps. As your steps carry you through the wilderness during a 7-day/6 night mobile you will spend evenings relaxing in style. High standards and personal attention to detail make each camp an individual luxury for the traveller. The combination of the adventure of walking, coupled with the opportunity to spoil yourself with hot refreshing showers and exceptional hospitality at each camp makes this the ultimate safari experience. Spectacular wilderness and beauty and a haven for a wide variety of plant and bird life: Islands of Siankaba and Chete Island.